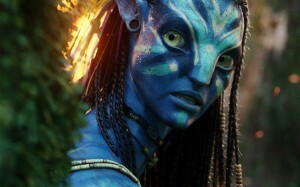 When 20th Century Fox first released the mega blockbuster Avatar as a movie-only DVD and Blu-ray, the studio promised to later issue a bigger set with all the special features. Fox more than delivered on its promise with the three-disc Avatar Extended Collector’s Edition. When we first opened the box, our immediate impression was that Fox continued with the environmental-responsible message of the movie with the packaging. The all-cardboard box sets the three discs in a beautifully printed book that’s similar to the studio’s recent Alien Anthology release. Of course, the science-fiction movie itself is the jewel in the package (the original movie-only release is a bestseller on DVD and Blu-ray), but Fox upped the ante on that too, providing the film in three versions: the original, an extended edition with 16 extra minutes and a version with a family-friendly soundtrack for those who are careful about what their kids hear. In the extended edition, the new footage comes quickly with an interesting scene with Jake Scully back on Earth. The new scenes are spread throughout the film, but if you don’t want to sit through the whole thing, the Blu-ray has the option to jump straight to the new parts. As well as the new footage put in the movie, the discs offer a load of deleted scenes in various stages of completion, including a user’s guide for the unfinished shots. Included is an extended ending with shows footage of Na’vi children playing and Jake Scully in his Avatar touching the belly of Neytiri. Possible pregnancy for future movies? Watching Avatar again, it’s easy to see how much work was put into the film and how meticulous director James Cameron was about every detail. He seems to have been as meticulous on the Blu-ray special features. For example, the art reel isn’t the usual string of concept art, pre-visualization and other shots. Instead, it’s combined with the movie’s score and lines from the film. Cameron is all over the featurettes on the discs. The making of the movie is detailed in the four-part “Capturing Avatar,” in which Cameron says Avatar is the “longest and most complex film I’ve ever made.” That’s saying something when you consider his filmography. In the featurette, “A Message From Pandora,” Cameron explains his inspiration behind the movie, and there’s footage of the filmmaker and his wife at a village in the rain forests as they fight against the proposed building of a dam, a situation that mirrors the story of the Na’vi in Avatar. The discs have numerous other featurettes, delving into all aspects of production, even the carving of statues for the film’s characters. Plus there’s screen tests for Sam Worthington and Zoe Saldana, as well as others, including Giovanni Ribisi, available online through BD Live. Footage isn’t the only material offered on the discs. Completists will love to check out the “scriptment” Cameron first wrote for Avatar, the screenplay and a 449-page Pandorapedia, which includes an English-Na’vi dictionary, for those who can’t get enough of the world. All in all, between the film and special features in this package, fans will be busy for a long time. Wow, this is a lot of stuff. And now I’ll be able to speak in Na’vi to my wife! This sounds like an amazing release!